This training is designed to give teachers across content areas the tools to implement inquiry-based teaching and learning in their classrooms. Give your teachers the personalized, specific feedback they need to apply what they have learned in training. Great Books Video Coaching is an effective way to provide the tailored individual support your teachers need. Our highly interactive, live webinars provide ongoing professional development. Course fee is $171–$599 per person, depending on enrollment. Blended course includes a goal-setting meeting, one day (6 hours) of live instruction, a post-course meeting with a trainer, and a choice of Getting Started options. Live course includes a goal-setting meeting, two 5-hour sessions on consecutive days, and a post-course meeting with a trainer. 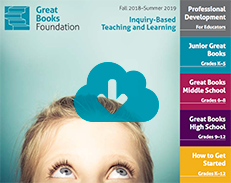 Give your teachers the personalized, specific feedback they need to apply what they have learned in training and to become highly proficient at the inquiry-based teaching skills that make Great Books programs so successful. Research shows that in-person, teacher-focused professional development supports the implementation of new strategies in the classroom and, over time, mastery of these skills. Our team of educational consultants will work closely with you to customize the best ongoing professional development plan to meet your goals and help you stay within your budgetary guidelines. 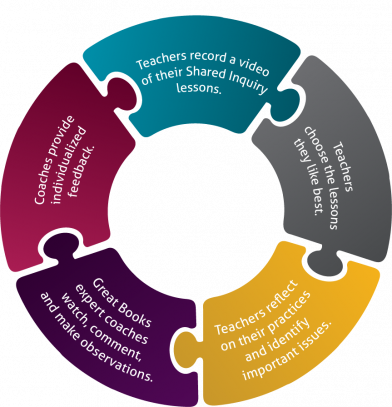 Great Books Video Coaching, alongside our on-site coaching visits, is an effective way to provide the tailored individual support your teachers need to deliver the full benefits of Great Books programs and make the Shared Inquiry method of learning part of the culture in every classroom. Choice. Teachers select video segments for feedback—allowing them to target specific goals, classes, or content—and select who can view the videos. Convenience. Videos can be recorded on any device and uploaded at any time. Expertise. Great Books coaches are masters of Shared Inquiry who are focused on supporting teachers and their growth. Personalization. From novice to expert, each user receives individualized feedback and suggestions for improvement and next steps. Impact. Increase the number of teachers who can be supported and provide more coaching opportunities for each teacher. Growth. Increase teacher growth, development, and impact. Our highly interactive, live webinars provide ongoing professional development. You can choose from our existing offerings, or we can help you customize online training sessions for your staff. We also offer volunteer leader training for parents and other volunteers conducting Great Books programs. This live webinar covers the essentials of Shared Inquiry and prepares volunteers to lead discussions with students. The live webinar is 4 hours over two days for only $99 per person. Most webinars are 90 minutes and only $85 per person—a great value! Contact us to customize an online training for your staff!